What happens here: A family enjoys watching movies, making popcorn, entertaining friends and hosting overnight guests. Looking at this room now, you’d never guess two cars used to sit in here. This screening lounge-guesthouse is about half of what was originally a four-car garage with a little extra room beyond that. 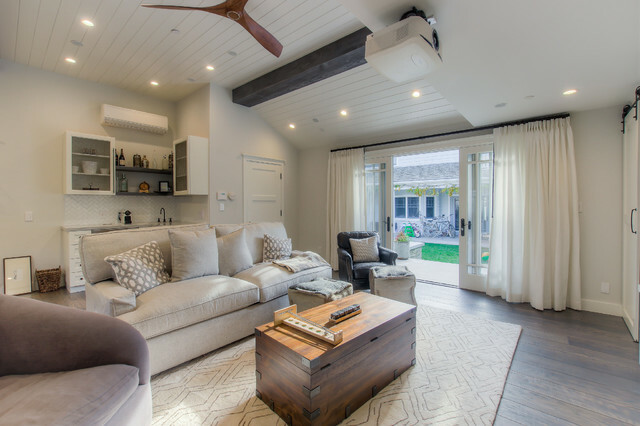 Working with the design-build pros at Spazio LA, the homeowners left room for two cars in one part of the garage and converted the remaining half into living space. The converted portion includes a comfortable screening room, a bar, a bathroom and a Murphy bed. The new glass doors on the left lead to the backyard and main house. 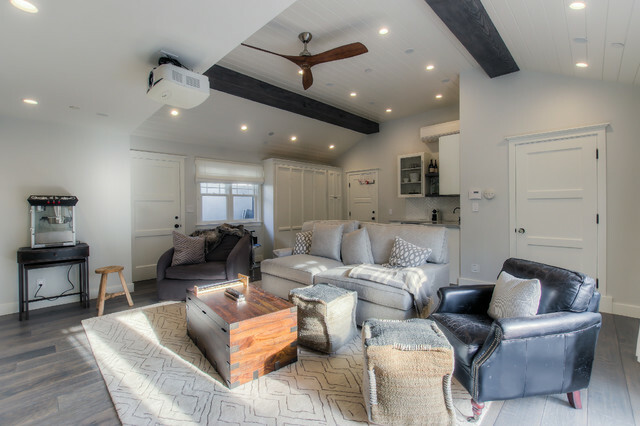 The space has modern farmhouse style. The new ceilings are covered in shiplap accented by reclaimed wood beams. 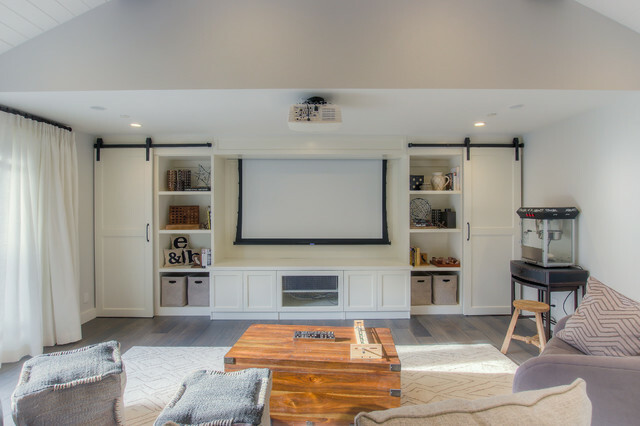 The retractable projection screen is surrounded by custom built-ins with sliding barn doors that hide equipment and storage areas. Behind the sofa, designer Essi Safdie made the most of the corner, tricking it out as a bar-kitchenette. The upper cabinets have chicken wire grilles instead of wood or glass. There’s also a sink, wine refrigerator and regular refrigerator. 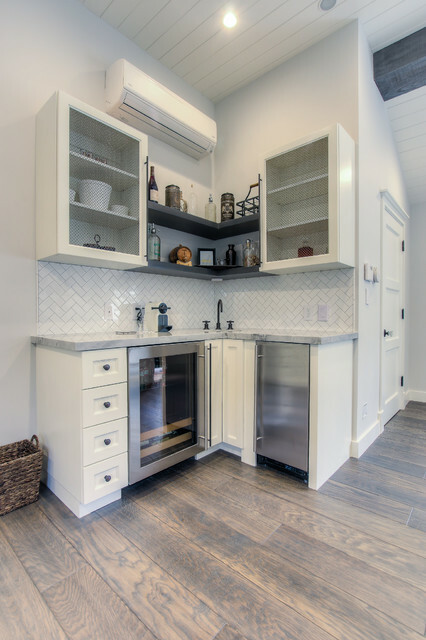 The counters are quartzite, and the backsplash is subway tile in a herringbone pattern. This shot gives us a good look at the flooring, which is engineered oak, an apt choice for a garage with a concrete floor. It is glued directly onto the concrete. These kinds of floors come finished, and this one has a weathered look with a hint of gray to match the light gray walls. 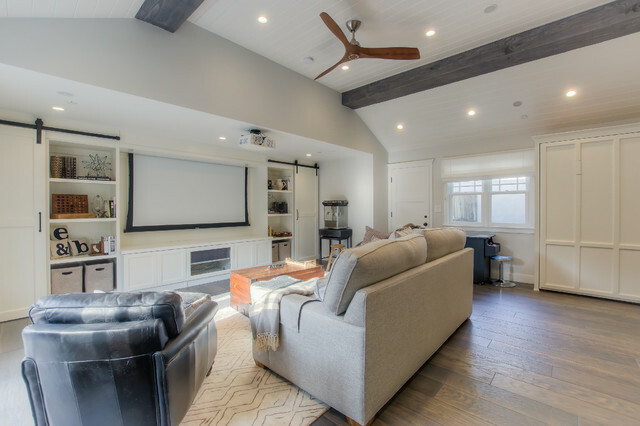 Over to the right of the built-ins, the family has a free-standing popcorn machine for movie nights. The photo below is a close-up of the paneling seen on the right side of the photo, which conceals a Murphy bed. To the right of the Murphy bed is wardrobe storage. The three-paneled doors with crystal knobs also lend a modern farmhouse look. 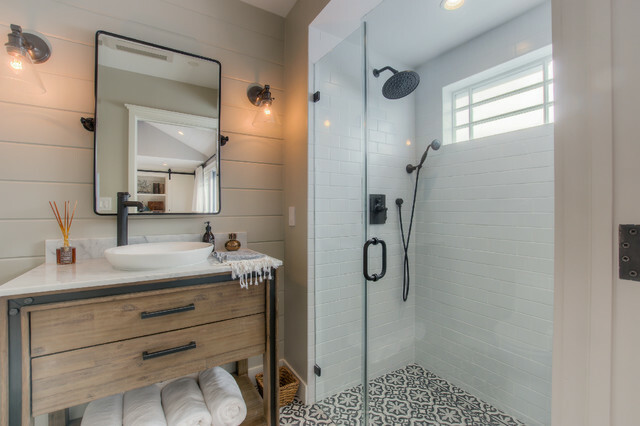 So do the bathroom’s shiplap walls, rustic wood vanity, glass and bronze pendant lights and water pump-like faucet. All the fixtures are oil-rubbed bronze. 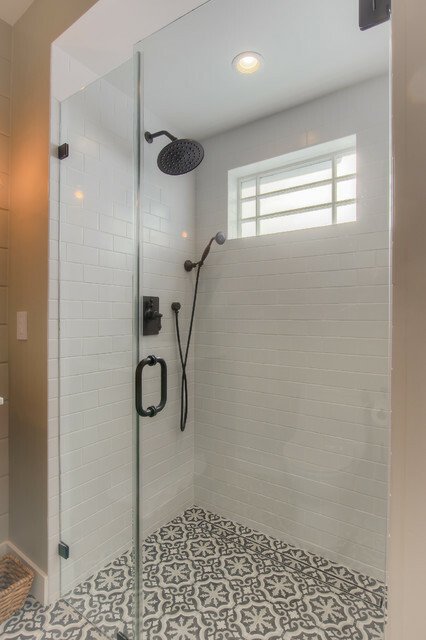 The encaustic cement tiles add a lively pattern on the floor. The curbless shower slopes down toward the infinity drain along the side wall. The infinity drain is tiled and thus almost invisible. What’s your favorite part of this garage makeover? Let us know in the comments below! 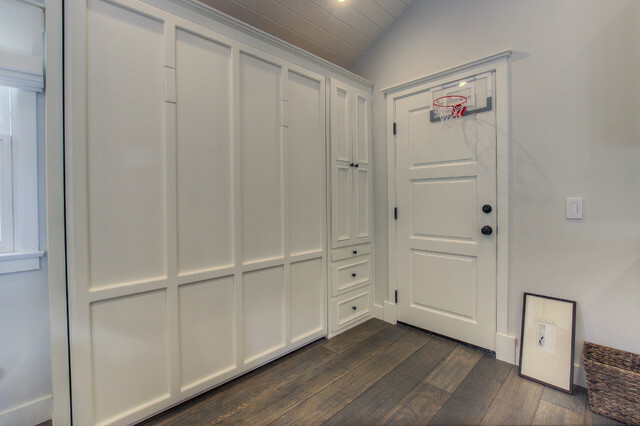 This entry was posted in Home Design and tagged Amarr, amarr garage doors, building products, Entrematic, garage, garage doors, home design, interior design, organization, overhead doors, remodeling, sectional doors. Bookmark the permalink.